The marching, with flags and banners flying started in the Mt. Vernon area on Charles Street. 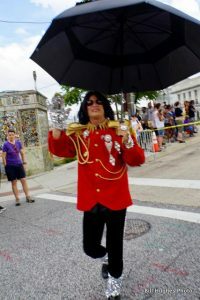 There were bands, dancers galore and floats of various descriptions and even a Michael Jackson lookalike. Corporations showed their support, such as the “UPS Company,” by sponsoring an entry and displaying their corporate logo. The parade, about two hours long, made its way up the city’s main boulevard; pass my alma mater, the University of Baltimore and historic Penn Station, and onward to North Avenue. A reviewing stand was located there at its intersection with Charles Street. Mayor, Catherine Pugh participated in the parade, along with the City’s Police Commissioner, Kevin Davis. Rep. John Sarbanes (3rd District); U.S. Sen. Chris Van Hollen; Baltimore City Councilmen Bill Henry (District 4); Baltimore County Executive, Kevin Kamenetz; and one of my fave social justice activists, Hassan Giordano, also joined the festivities. Giordano is running for the Office of Clerk of the Circuit Court for Baltimore City. All of the above are cary carrying Democrats. Before the parade, there was a Pre-Pride Extravagance Show. It took place at North Avenue.and Charles St, on the northwest corner close to the Wind-Up Space. After the parade, a good old-fashion Block Party was held on north Charles Street just above North Avenue. One of the scheduled performers was “Big Freedia.” This area is known as the “Station North” community. 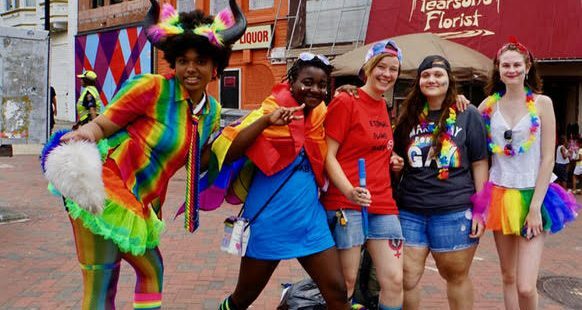 The Baltimore Pride Festival dates its origins back to 1975. 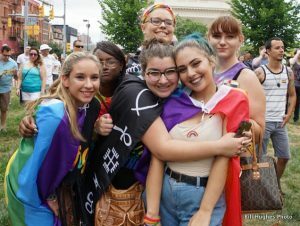 According to its program notes, it is Maryland’s largest “SGL/LGBTQ visibility event.” An estimated “30,000 revelers” enjoy the festival each year. This gala is also the GLCCB’s largest “fundraiser.” For this year’s event, the theme was “Pride: Unleashed.” Jaban M. Lyles is the president of GLCCB and Baltimore Pride.